What’s wrong with extra weight on commercial vans? Commercial van gross vehicle weight ratings (GVWR) and payloads can differ from vehicle to vehicle. It is important to know what you’re working with when specifying or upfitting a specific commercial van. GVWR should not to be confused with payload capacity. GVWR includes the vehicle’s unloaded curb weight, passengers’ weight and cargo weight. 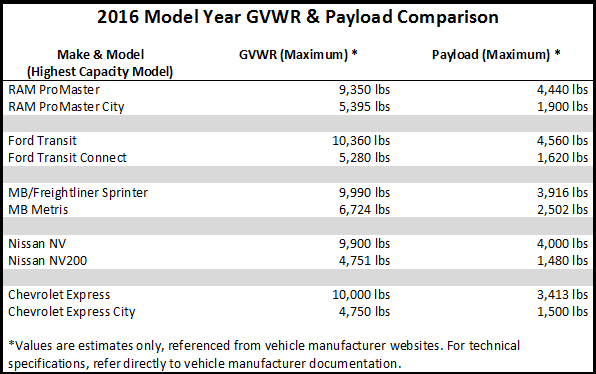 Payload capacity is the difference between GVWR and vehicle weight. For example: If a vehicle’s GVWR is listed at 10,000 lbs and the vehicle’s weight is 6,000 lbs (empty), then its payload capacity is 4,000 lbs. According to AboutAutos.com, gross vehicle weight rating is the vehicle’s maximum safe weight that should not be exceeded. Weight calculations include curb weight, additional equipment that’s been added, the weight of cargo and the weight of passengers. A vehicle’s GVWR never changes. According to Federal Motor Carrier Safety Administration (FMCSA), all commercial drivers of vehicles in interstate commerce with a maximum gross vehicle weight rating of over 10,000 lbs are required to obtain and maintain a valid Medical Examiner’s (ME) Certificate. It is important to note that though most commercial vans have a GVWR of less than 10,000 lbs, the Ford Transit does have a GVWR of over 10,000 lbs. If commercial vans are over-loaded, or at capacity in the case of Ford Transit, a ME Certificate may be required. According to Texas Department of Motor Vehicles, fines for on-the-road weight violations range from $100 to $10,000 for first offence. Fines double on subsequent violations within a year. Fines and other punishments vary in severity from state-to-state, and can even include prison time. According to Connecticut General Assembly, criminal charges may be brought against the owner or operator of an overweight vehicle if the weight of the vehicle is the proximate cause of a motor vehicle accident that results in death. Driver license requirements may be at risk. Monetary fines may be imposed. Business operations may be affected. Prison time and criminal charges are not out of the question. With these important issues in mind, it makes sense to reduce the weight of vehicles by incorporating the lightest components possible. An example of how you can reduce vehicle weight on Service Vans is with the use of VMAC UNDERHOOD air compressors. Traditional air compressors mounted in the cargo area can weigh as much as 375 lbs. The VMAC UNDERHOOD 30 CFM rotary screw air compressor weighs only 85 lbs. VMAC reduces vehicle GVW by up to 290 lbs. VMAC is the only air compressor specifically engineered for commercial vans, with 30 CFM rotary screw compressor systems available for the most popular commercial van models. For further benefits of weight savings in vans, check out VMAC’s previous article “Air power: Just why does air matter to commercial van operators”.